St.Nicholas Church is a Grade II* listed building. It is the first church designed by the architect Nugent Francis Cachemaille Day. In 1931 The foundation stone was laid. The ‘old’ hall was built and used for services. In 1932 the building was completed at a cost of £11,600. From 1963/64 an extension was added to create choir stalls to the rear of the building. In the late 1990’s the rectory and two halls were demolished and the land sold in preparation for the restoration project. At a cost of over £1million a complete restoration was carried out in 2000/02 under the guidance of the architect Anthony Grimshaw. The interior was redesigned with the rear (West End) of the church , including the choir stalls , being converted into a hall for community use. The new hall and worship area are separated by a moveable screen and a striking glass circular meeting room has been constructed at first floor level. The exterior remains as in 1932. As a part of the restoration a new rectory was built on the corner of Kingsway and Poplar Road. The new building was dedicated by the Bishop of Manchester in June 2002. Individual parishioners and visitors to St. Nicholas react in different ways to the cross over the altar. Some find it very much in keeping with the Art Deco design of the church whilst others would prefer a more traditional cross. 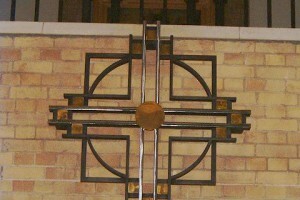 The new Cross which was made for the restoration of the church, completed in 2002. 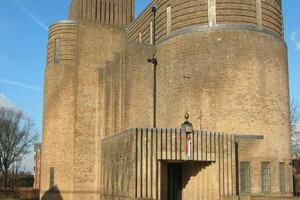 Anthony Grimshaw, the architect of the new cross incorporated a great deal of Christian symbolism in his design. The large circle symbolizes eternity and its origins can be traced to the Celtic culture of the British Isles. The elongated vertical lower part of the cross is the oldest form of Christian Cross and was called God’s mark. The small brass disc represents the Host. The three-part brass ends to the arms of the cross represent the trinity, twelve in number representing the Apostles. The sizes and colour of the metal sections matches the Lady Chapel screen which can be seen beyond the sanctuary wall. The cross was made by Alan Dawson.